The new Nightwatch features all of the same benefits as the popular Lightning 2 and then some. With the Nightwatch you get a retractable rain fly, allowing for unhindered stargazing. Plus the two gear ports have been upgraded to be usableas doors when the fly is rolled back. I've set up this tent about seven times, and used it under a variety of conditions from 45 degrees to 75 degrees. I hesitated to write this review because it seems to me that the definitive test for a tent of this design would be blowing rain (to test the awning), and haven't got do that yet. But otherwise I thought I would contribute a few impressions. Overall, this tent is excellent, and is a good example of the level of quality of design and construction you get from Sierra Designs. If this tent blew away tomorrow, I wouldn't hesitate to buy it again. 1. The three-position fly is incredibly versatile and incredibly easy to use - adjusting it takes a moment. I loved it. 2. The gear closets cannot accommodate a truly large pack, but other than that they are very handy. The tent entry door stays completely clear instead off the usual mess, and two gear closets adds up to a lot of space per person. 3. The awning is just a lovely feature - it opens up the whole front of the tent visually, creating a large sense of space. 4. I could be wrong about this, but the floor coating seemed much more robust than the coating on other brands of the same fabric weight. 1. I have no idea how to fix this (or even if it should be fixed), but when the instructions say "there will be a lot of tension" when installing the main hoop, it's an understatement. This is the first tent I've ever set up that literally requires considerable strength to do so. 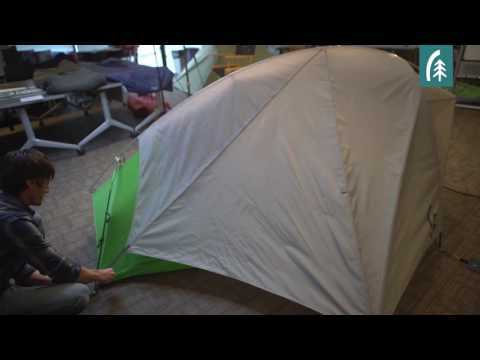 Don't buy this tent unless you are capable of entering a lot of pressure with your arms. Otherwise, setup is a piece of cake. 2. I don't believe that it's truthful for Sierra Designs to describe this as a "freestanding" tent. 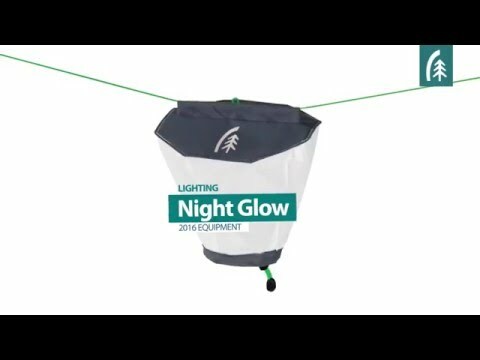 This tent is described as having all of the features of the Lightning 2, and the Lightning 2 is described as freestanding. I don't know if there is a standard definition of freestanding, but without stakes, this tent is less usable than any other freestanding tent I've ever used. I don't see how it could be used freestanding except in an emergency - the stakes are required to give shape to the tent in a number of important ways. I have heard it described elsewhere as "semi-freestanding." Since that phrase seems meaningless, I would just be honest and say the tent needs to be staked out. 3. I believe that the stated length of 86 inches (over seven feet) is a measurement of the total length of the tent, not just the floor, or some kind of measurement of the floor stretched to its maximum length. Anyone who is using this measurement to check whether it will accommodate their height will be disappointed - I think the usable floor length is actually about 82 inches. 4. Don't know how to fix this, but it's difficult to enter the tent wearing a hoodie with the hood hanging down your back - the awning pole, which comes to a point, catches your hood every time. It was mostly just a source of amusement! Virtually all of the reviews of this tent and the variants on the awning design mention condensation. There was some condensation, especially at low temperatures, but it did not appear to be a result of any design flaw. Rather, it seemed to be an inherent limitation of the use of single-wall material near the tent foot to save weight. The condensation was no more or less than any other tent I've used with these materials. There's no perfect tent, but I was impressed with the thoughtful design of this one, and have enjoyed using it. Look forward to watching this design continue to evolve.